Visiting my Nani’s house is always one of the best parts of my Pakistan trip. The love, affection and familiarity with every nook and corner is priceless. I feel that my childhood is preserved in my Nani’s house and holds so many memories that are unlocked once I enter there. As I shared visiting my Nani’s house on my Instagram stories many of you wrote back how you could relate to the experience. I’m grateful to all of you for the love and prayers for my adorable Nani. May Allah give her a long healthy life, ameen. 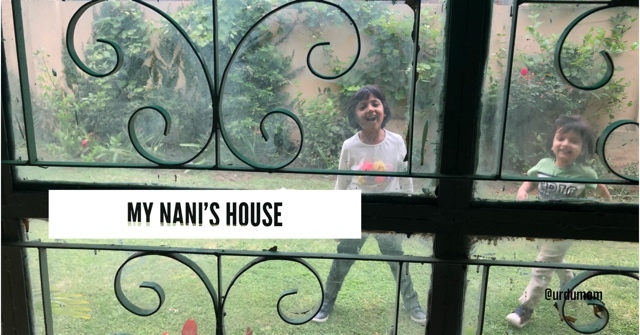 Here are some of my favorite sights and sounds from my Nani’s house. I love this welcoming door and how my Nani is always MashaAllah standing there to greet me. May she have a long life, ameen. I love the peace and calm in my Nani’s bedroom that I can not find anywhere else in the world. I wish I could bottle the tranquility here and keep with me forever. There is no food like the one cooked by my Nani. I have grown up enjoying her cooking and it’s still the best in the world. My Nani’s presence is like a lovely energy flowing through the house with her management, prayers and care. My Nani’s sewing machine brings back many memories of watching her stitch our dresses overnight and fixing anything that the tailor made (because it did not come up to her standards). My nani has had this metal cupboard in her room since forever. I love the sight of her opening it and it still seems as magical as did in my childhood with treasures unknown. This picture wall in my Nani’s house is so special with pictures of my great grand parents, cousins and weddings. My Nani’s love, affection and hugs are ofcourse the best part! When I was a child I could stare at the decoration pieces in my Nani’s house for hours (hello, childhood before iPads)! Now when I look at them, I’m transported back to life years ago and many memories are unlocked. My Nani’s garden remains beautiful in any weather. It is priceless watching my children play in the same garden as I did when I was their age and relive my childhood. What are some of your favorite memories from your Nani’s house? This is truly beautiful, and the photos (though not the same) reminded me of my naani’s home. We call her Ummumma. Thanks so much! Lots of love for your Ummumma! Awww, it brought back memories of my Nani’ house in F-6/1 and we call her nano. May Allah bless her soul. No one replace the love and little old details that she had at her house. May Allah swt bless your nani with Jannah, ameen. This was so so beautifully written and though the images were different, it took me back to my Nani’s house in Lahore. She had a weird sense of tranquility in het room, her antique wooden almaari was always there in a corner, her sewing machine a staple in the corner of the living room and the meals she cooked which we only started to appreciate more and more once we were older. I am visiting Pakistan after 5 yrs, insha allah next month. She passed away 3.5 years ago. I have such a sinking feeling that I will go to her empty room this time.